Sharp’s AQUOS BOARD™ PN-L603A is designed for smooth and effortless communication in a wide range of contexts. The PN-L603A’s highly responsive touch pens allow several people to write on the same screen at the same time. And Sharp’s Touch Display Link software enables multifaceted wireless communication. Whether in the boardroom or the classroom, Sharp changes the way you communicate. 60″ Class (60 – 1/16″ Diagonal) Screen Size – Combined with Sharp UV2A photo alignment technology, helps create brilliant color images with maximum size and impact. 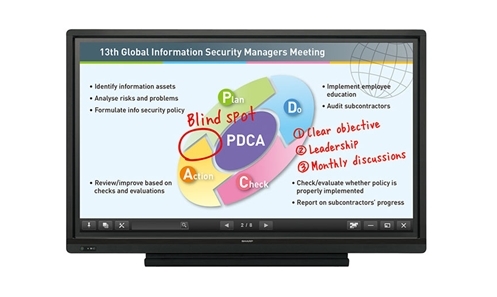 10 Point Multi-Touch/Multi-User System – Recognizing up to 10 points of contact, the PN-L603A allows up to four people to write on the screen at the same time using touch pens or fingers.